Despite available guidelines on indications for fresh-frozen plasma (FFP) transfusion, inappropriate use is increasing worldwide. We evaluated FFP administration to patients admitted to the Steve Biko Academic Hospital over 4 months, including indications for use and completeness of requisition forms. Transfusions were considered inappropriate for 39.5% of units administered. Of request forms submitted, only 22% had sufficient information for the blood transfusion services of the indication for transfusion. Transfusion with FFP is a medical intervention that carries risks and should be undertaken with care. Although this study was conducted in one centre, it is evident that clinicians' lack of knowledge of the indications for administration of FFP is widespread. Intervention is necessary to improve patient outcomes and reduce expenditure. Despite available guidelines on appropriate indications,2 there is increasing worldwide use of FFP transfusion4 with inappropriate indications,5 particularly in tertiary healthcare settings.4 We evaluated the utilisation of FFP and the prescription practices of attending clinicians in a South African tertiary hospital. All patients who received FFP transfusions from February to April 2010 at the Steve Biko Academic Hospital were included. All units were exclusively requested by doctors, and indications of transfusion and completeness of requisition forms were evaluated. Appropriate indications were based on Guidelines of the South African National Blood Transfusion Service (SANBS). Absolute indications are: replacement of single-factor deficiencies when factor concentrate was not available, immediate reversal of warfarin effect, vitamin K deficiency associated bleeding, acute disseminated intravascular coagulation (DIC), thrombotic thrombocytopenic purpura (TTP), inherited deficiencies in coagulation, and suxamethonium chloride apnoea. Conditional uses include liver disease, cardiopulmonary bypass surgery, and as part of a massive transfusion. In total, 416 requests were submitted for FFP, amounting to 1 020 units transfused in 312 patients. Internal Medicine, General Surgery, Surgical ICU, and Obstetrics and Gynaecology were the departments that used the most FFP units. Of units transfused, 289 (39.5%) were considered inappropriate. Of the more than 60% of appropriately transfused units, disseminated intravascular haemolysis and massive transfusions accounted for more than 60%. Vitamin K deficiency (with or without warfarin effect) in the presence of active bleeding accounted for 20% of cases (Fig. 1). Most of the inappropriate transfusions were classified as the patient's final diagnosis stated on the request form, which had no bearing on the indication for transfusion. 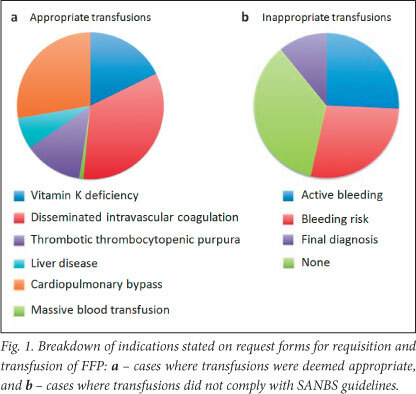 Despite evaluating the patients' laboratory records, the reasons warranting transfusion with FFP could not be determined. In more than 25% of cases, patients had features of bleeding, but FFP was administered without red-cell concentrate, and they did not fit the criteria for a massive transfusion. In the remainder, patients were either at risk of bleeding with no active bleeding at the time of ordering FFP and no subsequent laboratory features of bleeding (decrease in haemoglobin concentration or haematocrit), or no indication or diagnosis was supplied. Of note, most of the bleeding risks were due to platelet dysfunction (renal failure or idiopathic ITP), and administration of FFP would have had minimal impact. Most of these inappropriate cases were from the Departments of Obstetrics and Gynaecology and Internal Medicine. Of all request forms submitted, only 22% contained sufficient information for the blood transfusion services of the indication for transfusion. FFP is a frequently used blood-derived product, and worldwide inappropriate use has been noted.4 This has a significant impact on medical costs and patient morbidity and mortality.1 To identify areas for improved patient care and reduced resource expenditure, it is essential to determine local utilisation practices and adherence to guidelines. The auditing process is valuable in determining areas requiring improvement, and its use in transfusion medicine has been advocated.6 Evaluation of the requisition forms is a valuable indicator of appropriateness of FFP ordering.3 Therefore, we used both these parameters in our study to evaluate local utilisation practices of FFP. Inappropriate FFP use should prompt interventions including the use of local guidelines in hospital training,3 continuing professional development programmes,3 discussing patients receiving blood or blood products on daily ward rounds,6 and the use of computerised monitoring programmes. Although these have been implemented with varying degrees of success, intervention is needed when considering global trends in FFP use. In conclusion, transfusion with FFP is a medical intervention that carries a risk and should be undertaken with due care. Although this study was done in one centre, it is evident that clinicians lack knowledge of appropriate indications for the administration of FFP. Intervention is necessary to improve patient outcomes and reduce expenditure.